It was a dark and stormy night. (No really, it was!) The harsh rain and thunder were in accord with the unease I had of something to come. And so, it was in my safe home from the tumultuous weather that I took similar refuge from this worry at eight pm on Friday, June first, by booting up the online tournament demo for Mario Tennis Aces. Perhaps it was because of the fear I held that caused me to fail so utterly. More likely, I just sucked. No matter the cause, the result was the same: Four wins, two of which were due to connection errors, and 15 losses. I read the controls, but couldn’t conceive of a way to move as gracefully around the ball as my opponents, with even the most basic movements thwarting me. This wasn’t an escape; this was just more pain. I quit playing after an hour and watched some Netflix. My fears had been realized later that night, and while we all tried to focus on the good, it was hard not to feel down. Nonetheless, we took a three hour trip north for a graduation party. While I yearned to try my hand yet again at Mario Tennis Aces, SixTAY Days of Writing had begun, and I had to write through the noise of three younger sisters, two troubled parents, and one very noisy iPad. Because of this, I was still not quite done by the time we arrived, but I hoped to take a break at the graduation party of some largely unknown relative to sit down somewhere and finally get some time in for Mario Tennis Aces. Alas, it was not meant to be. My dad, in an act of frustrating courtesy, forbade me from getting my Switch out at all. If this was an attempt to get me to socialize, it was made in vain. After a half hour of introductions and eating, most of the teenagers there (who actually knew the graduate, by the way) had left, and I was left to fiddle around on my phone, which everyone knows is far more courteous than playing something that might hold other people’s interest and incite a conversation, or even participation, for the remaining two and a half hours. After about an hour more of writing on the way home, I decided to take a break and finally play more Mario Tennis Aces. This time, it wasn’t only my performance that was suffering; as could be expected from an online game requiring precision on a Nintendo console connected to a phone’s hotspot on a highway in the middle of nowhere, the connection was spotty at best. At worst, the ball moved like a slideshow across the court, not so much stuttering as it did stop completely, inevitably leading to a connection error. Whether my skills or the connection was to blame, the result was the same: more losses. But even once I got home with a stable connection, I lost any excuses for my terrible inadequacy. It was to the point where I was no longer enjoying the game, flailing like a fish out of water to perform the simplest maneuvers. Come on, it’s right there! The next morning, as my dad was preparing pieces for Sunday mass, I was reading through articles part of SixTAY Days of Writing. 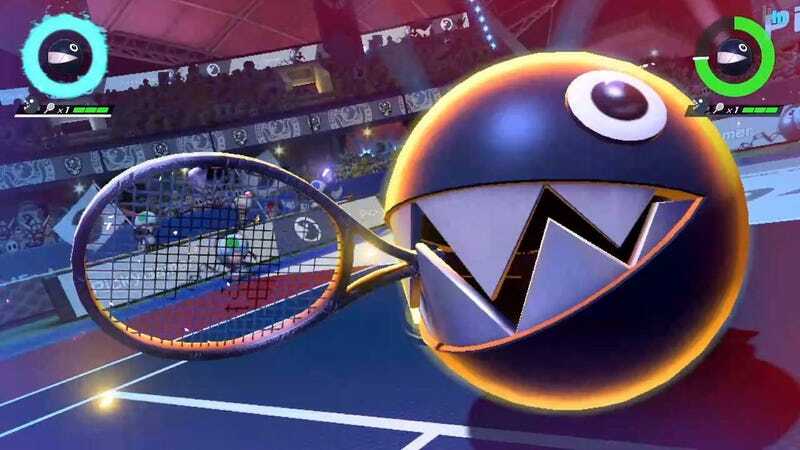 One article by RTLewis interested me in particular, going in-depth into implementing real-life tennis strategies to Mario Tennis Aces with very informative videos to go along with the written tips. With this new knowledge in hand, I tried it out later in the day, and began my journey into becoming a Mario Tennis Aces champion. I was still losing a lot at first, but I had a plan. I wasn’t aimlessly stumbling around the court. My moves had a new deliberation to them. Even if I didn’t execute it all perfectly, I knew where I was supposed to be, when I was supposed to be there, and what I was supposed to do. Mario Tennis Aces had turned from a game that evoked frustration to one that I couldn’t get enough of, and I ended up playing it for hours, getting ever closer to unlocking my most coveted character, the most beautiful, stunning, enchanting resident of the Mushroom Kingdom: Chain Chomp. Anyway, I was playing as Rosalina in the meantime, when a familiar name appeared as my opponent: Ryan. Thinking back to the last time I had seen that name, I remembered: It was the username of RTLewis, the very one who had taught me all that I knew! I was determined to have the pupil defeat the master, putting my all into every swing. But I was not yet ready: When I got too close to the net, he would shoot far away, and when I got too far, he would shoot close. I managed to use some of the techniques he taught me to psyche him out a few times, but he quickly caught on and ultimately defeated me. What I would only learn the next day, however, was that this was a different Ryan from RTLewis. I hadn’t just been defeated by the master; I’d been defeated by the master’s imposter! Not knowing this at the time, I vowed to continue on my path to glory until the end of my days, or at least until 2am when the tournament closed. But in order to do that, I needed more than just skill. I needed a weapon, one to turn the tides in my favor. And not much longer after I thought this, it came: Chain Chomp had been unchained, and would now carry me to victory! Sure enough, the Chomp’s power and relative mobility, along with his winsome smile to inspire me, was what I needed to reach my full potential. As I edged ever closer to the finals, my Chain Chomp was there alongside me, and together we climbed the ranks to arrive for the first time at the finals! As the competition arrived in the same metal cage, I knew that this would be the battle of the ages. Perhaps the only thing that could thwart me and my Chain Chomp: Another Chain Chomp! But this was no time to back down. It was literally the eleventh hour, and Chain Chomp and I both knew that we might never get the chance to compete in the finals again. I didn’t need to feel the Joy-Con vibration imitating a heartbeat, as I could feel my own heart beating out of my chest. I had RTLewis’ wisdom. I had Chain Chomp’s power. Now, all that I needed from myself was courage. And thus, it began. Against no other than the problematically named PEPE, I anticipated the first serve. This Chomp didn’t mess around, but neither did I. We would go back and forth, shooting the ball the furthest possible place from the other, but we would always spring back into position. But PEPE launched his special, and aimed for the metaphorical throat. I didn’t back down, slowing down time to try and get the perfect block… and I missed, breaking one of my two rackets. But not long after that, I did the same to him, breaking his racket. At one point, we both had maxed out our power gauges, and right after PEPE launched his, I launched mine, shooting not away, but right towards him. Not expecting this, PEPE hesitated and got hit by the ball! With this final inspiration, I knew that we could win. I launched my special, aiming for the (yet again metaphorical) throat once more. But PEPE didn’t back down. Using all of his power gauge to slow down time, he set up his shot to block, but at the last moment got cold (metaphorical) feet, and backed away. This split second decided the game, shattering his bracket, and as I stood there in a puddle of sweat, shaking nearly uncontrollably, I realized after a few seconds that I had won! Perhaps never before had victory tasted so sweet, as PEPE’s Chain Chomp rolled onto his side in defeat, and mine leaped up and down, racket still between teeth, in exuberation. We had done it! The day before, I had been a fumbling idiot at this game, and now I was the victor, the king of the court! Then, minutes after I had won, the Switch died. It took me a few seconds to comprehend what this meant. Had I not won a few minutes sooner, my victory would have been cut short by the Switch’s battery life. I had dodged a bullet without even knowing it, but it was dodged nonetheless. But now, it was time to lay my Switch to rest, and along with it, Chain Chomp. With a knowing bark and smile, the Chain Chomp jumped up and down even as I reached for the sleep button, as if thanking me for our time together. Thank you, Chain Chomp, for carrying us both to victory. Perhaps, one day, we shall meet again on the tennis court.